Change in "don't ask, don't tell" is reflection of "common sense" and "common decency," Robert Gates said. President Obama and Adm. Mike Mullen, support legislative repeal of "don't ask, don't tell"
Washington (CNN) -- Defense Secretary Robert Gates announced Thursday that the Pentagon will start to ease its enforcement of the "don't ask, don't tell" policy prohibiting homosexuals from serving openly in the military. Among other things, Gates said the Pentagon is raising the threshold for what constitutes an appropriate level of information necessary to launch a "credible inquiry" into allegations of homosexual behavior. The change, which will take effect in 30 days and apply to all current cases, is a reflection of "common sense" and "common decency," Gates said. "These changes reflect some of the insights we have gained over 17 years of implementing the current law, including the need for consistency, oversight and clear standards." 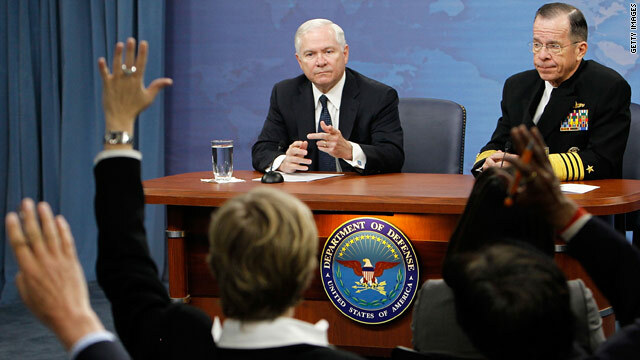 President Obama and Adm. Mike Mullen, chairman of the Joint Chiefs of Staff, support a legislative repeal of "don't ask, don't tell," which was first enacted in 1993. Some senior members of the military, however, have expressed concern over the impact of the ban's repeal on unit cohesion and morale, among other things. Last month, Gates announced the Pentagon had taken the first steps to prepare for a repeal of the policy. Laying the groundwork for such a change will take more than a year, he said. In the interim, he said, the Defense Department will start enforcing the policy "in a fairer manner." • The Pentagon will raise the level of the officer authorized to start a fact-finding inquiry or separation proceeding as a result of alleged homosexual conduct to a general or flag officer in the accused service member's chain of command. • Only a lieutenant colonel, Navy commander or higher ranking officer will be authorized to conduct a fact-finding inquiry. • Only a general or flag officer in an accused service member's chain of command will be authorized to initiate expulsion proceedings. • The Pentagon will revise what constitutes credible information to begin an inquiry or separation proceeding. For example, Gates, said, the Defense Department will specify that information given by third parties should be given under oath. The use of "overheard statements" and "hearsay" will be discouraged. • The Pentagon will revise what constitutes a "reliable person" upon which an inquiry can be initiated. According to Gates, "special scrutiny" will be given to "third parties who may be motivated to harm a service member." • Certain categories of confidential information will no longer be used in discharge proceedings, including information provided to lawyers, clergy and psychotherapists. Information provided to a doctor as part of a service member's medical treatment or to a medical official in the course of a public health inquiry also will not be used in discharge proceedings. Information given for either a security clearance investigation or in the course of seeking professional assistance for domestic or physical abuse also will be excluded. Last month, Gates told members of the Senate Armed Services Committee that "a guiding principle of our efforts [to change the policy on gays in the military] will be to minimize disruption and polarization within the ranks, with special attention paid to those serving on the front lines." Gates also said the Pentagon will ask the RAND Corp. to update a study it conducted in 1993 on the impact of allowing homosexuals to serve openly in the military. Since the "don't ask, don't tell" policy was implemented, more than 13,500 service members have been discharged, according to U.S. Rep. Jim Moran, D-Virginia. In 2009, there were 428 discharges under the policy, the lowest rate of discharge since implementation, he said. The highest year was 2001, with 1,227 discharges. Sixty-nine percent of Americans believe openly gay people should be allowed to serve in the military, according to a February 12-15 CNN/Opinion Research Corp. poll. Twenty-seven percent are opposed to such a change, the survey found. In 1994, shortly after the "don't ask, don't tell" policy was implemented, 53 percent of Americans believed openly gay people should be allowed to serve in the military, while 41 percent were opposed. CNN's Alan Silverleib and Barbara Starr contributed to this report.